﻿ PrimEVIL | Screaming Wont Help! Five Frightening Haunts ... Screaming Won't Help! Anyone under the age of 16 without an accompanying adult will not be granted access to the park. Our limited February Early Bird Offer is now available, £10 off "VIP" tickets, limited to the first 100 tickets. Check out our Tickets Section for the offer! 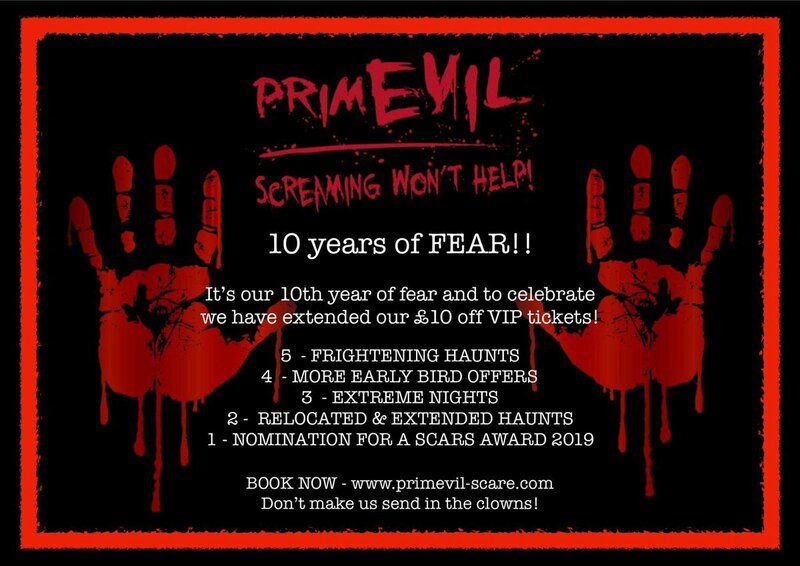 More Information about PrimEVIL's Attractions and Haunts for 2019 will be revealed soon! PrimEvil Extreme is on the 1st - 3rd November, the event is strictly for guests aged 18 years and over (Photographic Identification will be required) Our Haunts will be taken to the Extreme along with a Firework display. To purchase tickets for PrimEvil Extreme, choose the ticket you want below and select 1st, 2nd or 3rd November.